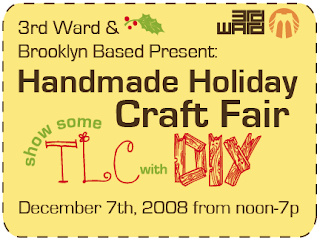 Browse the handmade goods & treats of over 50 local artisans, craft mavens & culinary masters including everything from LED Hula hoops & dog costumes, to custom cut clothes & jewelry, furniture & vintage ware from Brooklyn Kitchen, cookies & chocolates, wrapping paper, pillows & body soaps, custom electronics and Cut Brooklyn knives. PLUS free gift bags, live music from Sigmund Droid & VJ Clay Franklin, chili & corn bread from Tom Mylan (of Marlow and Sons, Diner & Bonita), FREE Gimme coffee, spiked drinks, a costume photobooth by Deluxa and FREE workshops in textile design, electronics and collage. When I was a kid I would rip open a gift with abandon, caring little what happened to the wrapping paper. It was agonizing to watch those people with the opposite approach, slowly and gently unwrapping, taking the utmost care not to tear the paper. But now I'm the one who's carefully disassembling the outer wrappings of a gift, so I can reuse it at least one more time. If I don't reuse paper or buy recycled content paper like the kind from Fish Lips, I try to find some other way of presenting a gift. Sometimes I'll decoupage a box with magazine clippings and scrap paper. But that can be time consuming. There's a much simpler and sustainable way to wrap gifts -- furoshiki. No need for paper, tape, or scissors. You don't even need ribbons to make it all pretty. All it takes is a piece of fabric and some folding skills. You can even use a scarf to wrap for a two-in-one gift. Please join us for Gowanus: A Sense of Place, a limited-time art show and sale running from Dec. 5 to Dec. 22, 2008, which will be comprised of representational views of streetscapes and landscapes of Gowanus and surrounding neighborhoods. The objectives of the show and sale are to raise funds for the Gowanus Canal Conservancy, highlight the Gowanus as the center of northwest Brooklyn neighborhoods, generate interest in the preservation of the Gowanus landscape, and foster opportunities for local artists. The works in this show will also be available for sale at the gallery and most will be priced between $200 and $1,000.